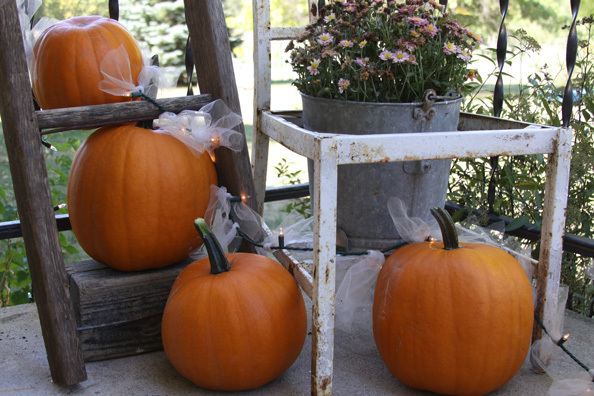 Here is a simple outdoor fall decor idea that takes minutes to put together but fills your porch with a soft glow that will last all fall long. 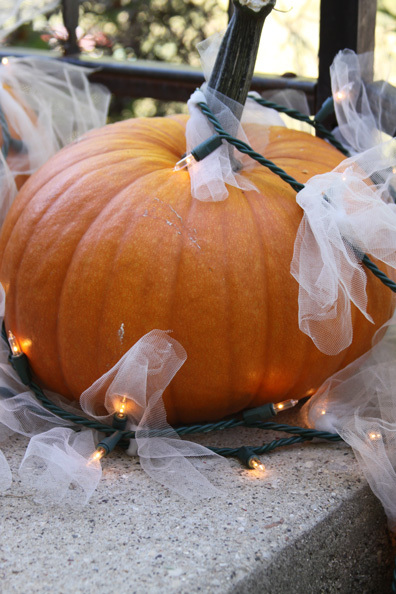 By combining a roll of tulle, a strand of Christmas lights, and a few fresh fall pumpkins you have a simple outdoor decoration that looks great during the day and at night too. 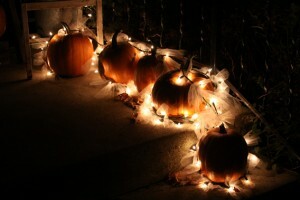 My favorite time of the year is just around the corner! The leaves are starting to fall and all of the comforts of fall are upon us. Due to a great patch of pumpkins that the kids and I planted in the garden this year we have lots of beautiful orange pumpkins to use as decorations around our home. The kids picked their favorites and quickly lined them up on the front steps in front of the house. 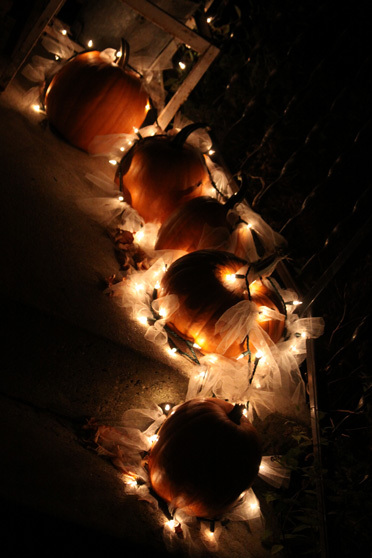 we were able to make a beautiful pumpkin lit path leading to our front. The best part is that it is quick, easy, low maintenance, and required using things that we already had. 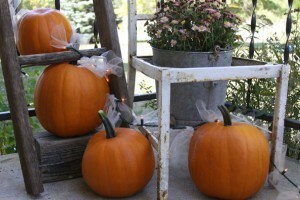 We started by adding the pumpkins to the decor already on the porch. 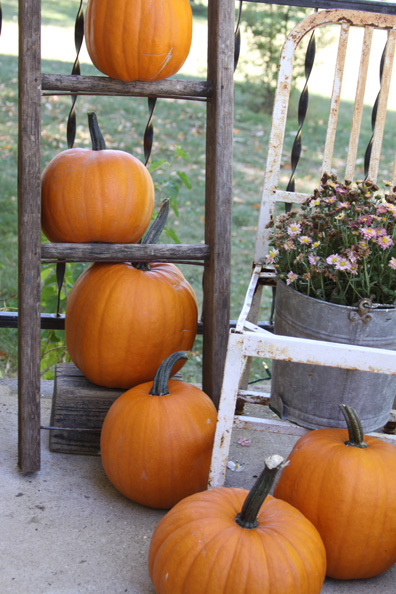 I had an old ladder sitting out already, so we stacked them up on the ladder rungs and made a pumpkin tower next to an old rusty chair that has a mum plant where the seat should be. I then remembered the stand of tulle enhanced Christmas lights that I put up at the beginning of the summer. 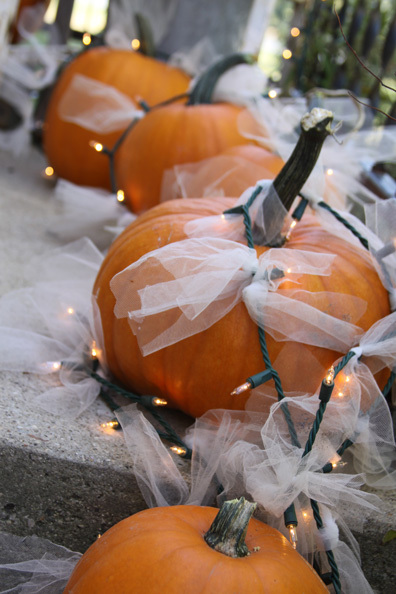 I had tied small pieces of white tulle down the strand and hung it out on the deck to softly illuminate a space that we used on summer nights. I thought that rather than storing it away until next summer that I would use it this fall as well. I used one roll of whote tulle and cut pieces from it that were about 6 inches long and tied them right onto a stand of white Christmas lights. I took the tulle covered lights and wrapped them around the row of pumpkins in a haphazard way. No rhyme or reason for the pattern, just so that they were secure and even around all of the pumpkins. Once the strand was secure I added an extension cord and Christmas light timer so that I don’t have to worry about turning them on and off at night and I was all done. I love how perfectly they light up the stairs on the porch with a soft, pretty orange light thanks to the pumpkins! It was fun and inexpensive to make and that makes me extra happy! It gives off a great fall ambiance and will help our pumpkins last until it is time to carve them for Halloween!